Crabbing, biting, and hiding - what's normal? 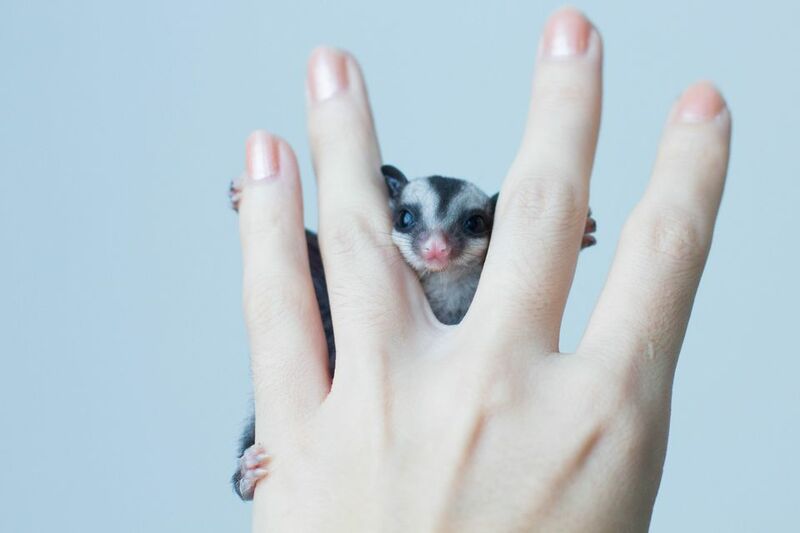 Sugar gliders are adorable little marsupials who call Australia, Papua New Guinea, and Indonesia their home. But they are also very popular pets in homes around the world. They have unique and specific dietary requirements but can be a lot of fun to care for - if you can understand their behavior. Wild gliders live in groups of up to seven adults (plus any babies that have been born recently) and are highly social. They live in trees, practice social grooming (which does more than just keep each other clean), and protect their territory that can include over two acres of land and trees. The dominant male marks the rest of his group with his saliva and by using his scent glands (on his chest and forehead) and can recognize the members of his colony with that unique smell. Once you understand what a normal, wild sugar glider does (and why he does it) you can better appreciate what your pet sugar glider does in captivity. If you have a lone glider as a pet you may need to understand that your glider craves companionship and if you are unable to be his social companion and commit to him the bulk of your day then he may be stressed. If you have an intact male you may experience more territorial behavior if he is not neutered because his instincts tell him if things don't smell like him they are a threat to his territory or colony. Overall, captive gliders aren't typically kept as wild gliders so we must either adapt our care to create a more natural environment for them or at the very least, understand that some of their behaviors are normal for the species (i.e., being nocturnal, scent marking, crabbing when scared, etc.). Sugar gliders are very social and can be extremely friendly to humans if handled regularly (especially as a young joey). Normal sugar glider behavior is that gliders will bond with you if they are kept alone and you create enough time to spend with your glider on a daily basis or they will bond with their sugar glider mate if you allow them to have a friend (or friends). Crabbing is a normal sound gliders make when they are scared, upset, threatened, etc. It is often heard when you wake a sleeping glider if you disrupt or try to pick up a glider that is scared, or when you take your sugar glider to see his vet (find an exotics vet near you) if he isn't used to those surroundings. Scent marking is normal for males to do to their belongings and their social group or mate. Your glider may mark you by rubbing on you or even dribbling some urine on you. This smell and behavior can be limited by having your male neutered. Sugar gliders are nocturnal so they typically will not be active during the day. This doesn't mean you can't bond with your glider while you are awake and he is sleeping but it does mean that he may get a little crabby if you try to wake him up to play with him. Most glider owners have a cloth or fleece pouch they wear around their neck and under their shirt during the day. This keeps their gliders close to them so your scent will stay familiar with your pet sugar glider. This is especially important to do with joys and new gliders who are not familiar with you and have not bonded with you yet. Sugar gliders typically enjoy their food in the evening since they usually sleep during the day. This may mean you can't share your meal times with your pet and you need to make sure their meals are fresh when you go to bed, not when you are eating breakfast. Sugar gliders are arboreal so they like to climb and jump from place to place. They don't want to run around on the ground. They feel safe up high so they may immediately crawl up your arm, hide at the nape of your neck, or perch on the top of your head (hopefully they don't decide to urine mark you here). Make sure you encourage this normal behavior for both their physical and mental health but only allow it in safe environments. By offering a natural, safe, environment, appropriate diet, and regular enrichment, attention, and mental stimulation, your sugar glider can be a great addition to your family - you just need to take the time to understand each other.